With the hot but undoubtedly brief summer finally making an appearance here in the UK, I imagine that plenty of bit-tech and Custom PC readers have had to ramp up their PC's fan speeds to keep the machine cool. Maybe you've even had to buy new cooling hardware to keep that shiny new overclocked Intel Core i7 system under control? In any case, most of us have had to alter our PC's cooling at one time or another but what's always surprised me is how varied noise tolerance is from person to person and how different their goals are when tweaking their PC to enhance its cooling capability. It's my view that PCs should be seen and not heard which is why I hate hard disks and noisy GPU and CPU coolers and love SSDs and water-cooling. The quieter the better really and as much as my wallet screams at me, I'm prepared to pay the price to make my PC as quiet as possible. However this does have its drawbacks. For starters running fans at 800rpm means they shift a lot less air than at 1,500pm (which is the speed most of my case and radiator fans are rated at). This in turn means that I have to have both a double and a triple 120mm fan radiator to keep my 4.2GHz Q9650 and GeForce GTX 280 cool. This means added expense over and above what would normally be needed to cool my particular selection of hardware. But for me, having a massively overclocked but nearly silent PC is has always been my goal and I wouldn’t have it any other way. 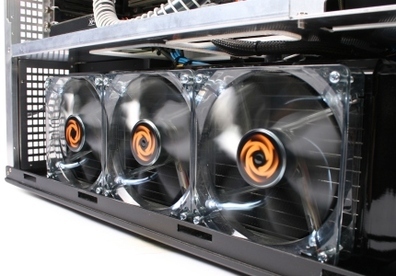 Plenty of fans and large radiators can keep overclocked systems cool and quiet. Friends of mine have had very different views. In the past they’ve been quite happy to let their GeForce 6800 Ultras shriek away, and they didn’t hesitate to use manual fan control to push its cooling to what for me were intolerable levels. However their systems did run cool - and of course, the extra cooling they often got was free too. 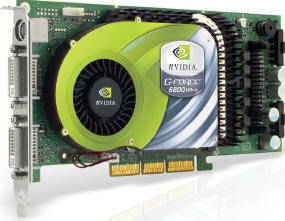 In games, graphics cards such as the GeForce 6800 Ultra spin up and become very noisy. The same is unfortunately true of many modern graphics cards too. A fan controller can certainly help fine tune things and provide cooling on demand but I believe once you’ve seen how quiet your PC can be, you’ll catch the noise reduction bug. Maybe it’s what you use your PC for that also counts – as I use it for everything from watching TV and films, listening to music, gaming, photo editing and work. There are times, mainly during film and music playback when I don’t want my PC noisily interfering. I’d like to know what your position is - do you spend a fair amount of time (and money) choosing quiet components, have you opted for water-cooling mainly to reduce noise or does noise simply not bother you, especially if it means getting cooling for free?